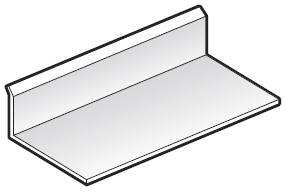 FloPlast White Cladding Drip Trim - 5m length. This is to be mounted on teh bottom of the installation - before the boards have been fitted - to provide a weather drip to angle any water away from the moutning wall. This can be used with either the 100mm V Joint or the 150mm Shiplap. Contacted PVC Building Products by phone for information on this product and found them to be very helpful . Order submitted and delivery was very prompt.